Ladies and gentlemen… I HAVE DONE IT!! November is over, and I have written 50,000 words of my book (actually, 51,644 to be exact). Isn’t it interesting how you can love and hate something so much? I love NaNoWriMo – it’s fun, it’s wordy, it’s insane. And yet I hate it – it’s stressful, it’s challenging, it’s sleep-depriving. 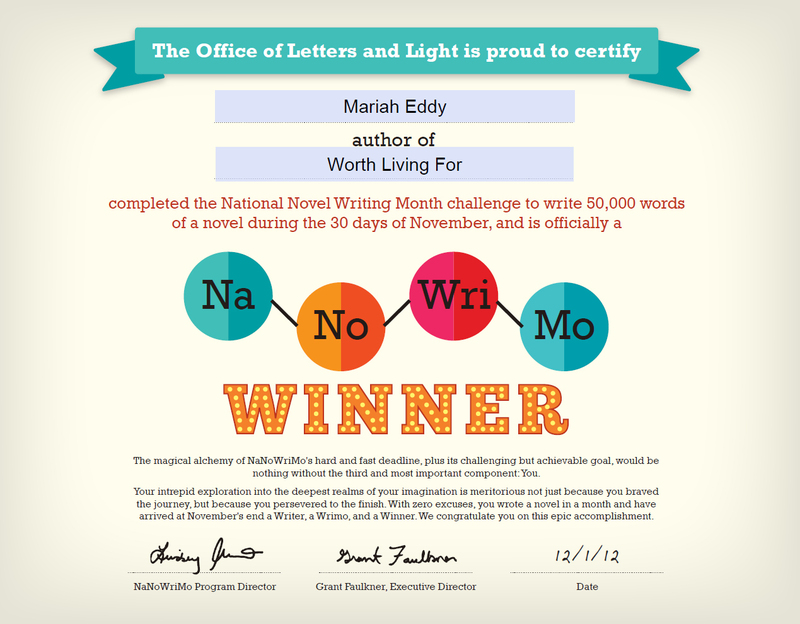 But my love for it has conquered the dislike, and I can truthfully say that NaNoWriMo has once again proved to be an amazing experience, and I look forward to doing it next year. I would just like to give a great big thank you to all of you who have been watching me on this journey. Thank you Mom for giving me school off. Thank you to my family members for putting up with me. Thank you Deanna for all your many encouragements. Thank you to all my wonderful friends who have been checking up on me, praying for me, and cheering me on. You guys are amazing! And finally, thank you God. I could not have done this without You. You gave me this story and a love for writing – thank You. I pray that this story gives glory to You.